A central tenet of DoD dogma regarding withdrawal of US troops from Afghanistan rests on Afghan National Security Forces reaching a force size of 352,000 and taking over full responsibility for security in the country as US forces leave at the end of 2014. There are multiple problems surrounding the myth of ANSF force size of 352,000. As reported last quarter by the Special Inspector General for Afghanistan Reconstruction (SIGAR), the “official” force size reported by DoD relies on self-reporting by Afghanistan and can not be validated. Further, NATO ministers proposed back in February that financial support for the 352,000 size should be extended through 2018, rather than allowing the force size to drop by about a third at the end of 2014. I equated this offer to dangling an extra $22 billion in front of Afghan government officials for embezzling in return for a grant of criminal immunity for US forces remaining behind after the official withdrawal. SIGAR released its latest quarterly report yesterday (pdf), covering the first quarter of 2013, and we see that the problems surrounding the myth of 352,000 ANSF force size persist and show no prospect of improving. Although the reported force size is only about 5.5% below the goal, it seems remarkable that Afghan officials developing their own numbers in a non-validated way were not able to reach the goals that are clearly known to them. Note that since the beginning of the 2005 fiscal year, we have provided nearly $14 billion in salaries for troop sizes that are self-reported in a non-validated system and therefore ripe for embezzlement. 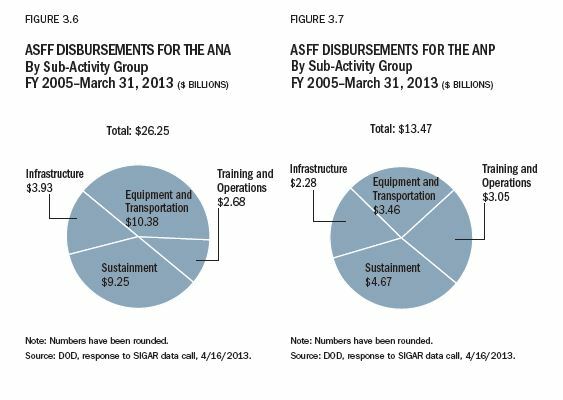 Further, another $13.8 billion was provided for “equipment and transportation” of ANSF, which would also seem a good source for corruption. That is a huge amount of money and it appears to be very poorly spent, given the lack of preparedness for ANSF. The goal to “train and field” 352,000 ANSF personnel by October 2012 was not met, although DOD reported that the ANSF reached its “recruiting” goal of 352,000. In its December 2012 report to Congress, DOD noted that the number of reported ANSF personnel fell in 2012 after civilian personnel were removed from ANA force-strength reports. DOD also said the date for achieving an end strength of 352,000 ANSF personnel is by December 2014: 187,000 in the ANA by December 2012, 157,000 in the ANP by February 2013, and 8,000 in the Afghan Air Force by December 2014. However, according to DOD, the dates for all of these personnel to be trained, equipped, and fielded are December 2013 for the ANA and ANP, and December 2017 for the Afghan Air Force. Thousands of recruits are quitting the newly formed Afghan police and armed forces every month, raising fears over their ability to protect the emerging democracy when coalition troops leave the country in less than two years’ time. For every 10 new soldiers recruited to the Afghan National Army (ANA), at least three are lost because they have been sacked, captured or killed in action, new figures have revealed. British officials admit that current “attrition rates”, with more than 5,000 soldiers quitting every month, threaten the force’s long-term effectiveness. The latest British Government assessments of Afghanistan’s progress towards the goals of stability and democracy confirm that the rate of recruits leaving is far worse than targets set by coalition leaders, amounting to 63,000 every year, or more than a third of the current size of the army. The Ministry of Defence (MoD) has warned that the ANA’s attrition rates “continue to represent a risk to the sustainability of the future force”. The figures raise huge questions over the ability of the ANSF to reach the size regarded as necessary to take the reins before thousands of international troops leave Afghanistan by the end of next year. Accurate and reliable accounting for ANSF personnel is necessary to help ensure that U.S. funds that support the ANSF are used for legitimate and eligible costs. However, SIGAR and others have reported that determining ANSF strength is fraught with challenges. U.S. and Coalition forces rely on the Afghan forces to report their own personnel strength numbers, which are often derived from hand-prepared personnel records in decentralized, unlinked, and inconsistent systems. CSTC-A reported last quarter that there was no viable method of validating personnel numbers. This quarter, SIGAR began an audit to assess the reliability and usefulness of data for the number of ANSF personnel authorized, assigned, and trained. This audit will also look at the methodology for gathering data on ANSF, including the extent to which DOD reviews and validates the information collected. It will be very interesting to see how DoD numbers for ANSF force size “evolve” as the SIGAR audit moves forward and force size accounting practices are called into question. In February, then Secretary of Defense Leon Panetta said supporting a 352,000-strong ANSF through 2018 is “an investment that would be worth making, because it would allow us greater flexibility as we take down our troops.” This is a change from the 228,500-strong ANSF that leaders of nations contributing to ISAF envisaged at the Chicago NATO Summit in May 2012. It seems highly unlikely to me that at this point either President Obama or Congress will step up to point out the folly of this move and what a poor investment it represents. The only hope is that the plan will be withdrawn once Afghanistan refuses to grant criminal immunity to US troops remaining behind after the end of 2014, ostensibly to provide further support to this massive 352,000 strong ANSF.